Karuizawa appeared first in the history when the Edo Shogunate chose it as a post town of Nakasendo, the second link between Tokyo and Kyoto after Tokaido. When the Shogunate disappeared in 1868, the town lost also its importance and declined quickly until when a British priest, Alexander Shaw, built his villa because the climate is similar to Scottish Highland. Thanks to his zealous recommendation, many people had imitated him and since then the town has transformed to a big summer resort. During Nagano Olympic Games of 1998, the competition of curling will be organized there. Mt. 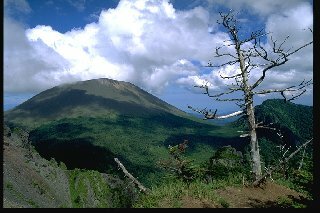 Asam is a three-fold composite volcano towering in the northwest of Karuizawa, between Gunma and Nagano prefectures and its highest point is 2565m. You will find a caldera called "Okama" at its top and toward the west, Mt. Maekake which forms the inner-ring. Moreover, there are Mt. Kurofu which forms the outer-ring and some parasitic volcanos such as Mt. Shou-asama (Small Asama). It commands a splendid view from its summit and belongs to Joshinetsu National Park. Since 685, about 50 explosions have been recorded. Even now, it continues to fume and is considered one of the most active volcanos in Japan. Since 1911 it has been under a continual observation and there is a volcanic observatory of Tokyo University on the eastern skirt. "Oni-oshidashi", a lava flow formed by the great explosion of 1783 is on the northern skirt: you will find there a strange landscape made up of odd rocks and caves.